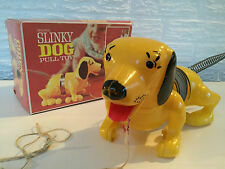 ULTRA RARE SLINKY DOG PULL TOY IN ORIGINAL BOX, "the name's JAMES"
Package included:1pc x rainbow spring. Vividly colored flexible spring. Material: plastic. It is a wonderful gift, which can bring fun for children. Helpful Links. Other item. You can be bent into various shapes this rainbow circle. Classic old-fashion play toy suitable for all children more than 3 years. Also note that monitor settings may vary from computer to computer and may distort actual colors. 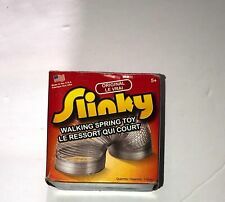 Vintage Slinky in box. Box has done damage but Slinky works great. See pics for details. Shipped with USPS Priority Mail. Name: Magic Rainbow Spring Type: LED Light Toys Model: MSCHQ0001 Material: ABS Plastic Electronic Component Color: As the picture show Size: 5x6cm(1.97x2.36inch) Weight: 50g(1.76oz) Battery Type: 3PCS Button Batteries Suitable For: Kids Over 3 Years Old or Adults Function: Kids Toys,Gifts or Magic Props. Folding classic gift circle spring toys glow in dark creative magical rainbow V! Made of Lightweight rainbow Coloured Plastic. Vividly Coloured Flexi Springs. 1 Pc Rainbow Spring Toy(random color). Due to the shooting light difference, It is a bit different from the picture color shown in website. New ListingSPECIAL! Slinky Craze Begins in 1945 Commemorative US Postage Stamp - MINT NH! (It is not an actual Slinky!). FREE protective clear stamp holder included. Height：9cm. Color: As the picture show,we have normal one and more shining one,we send it random. Material: Plastic. Vintage Slinky Eyes 1950’s In The box Rare Yellow Frame. Condition is Used. Shipped with USPS Priority Mail. 1pc x rainbow spring. Vividly colored flexible spring. Material: plastic. NOT THE JR SIZE - ---THIS IS THE ORIGINAL FULL SIZE SLINKY. Made of Lightweight rainbow Coloured Plastic. 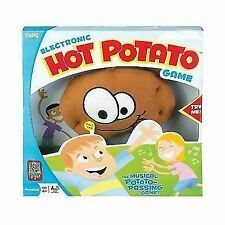 Suitable for ages 3 . Unit Type: Each. Serving Size. Number of Servings. Proudly made in the USA for 70 years. Trending at C $11.22eBay determines this price through a machine-learned model of the product's sale prices within the last 90 days. 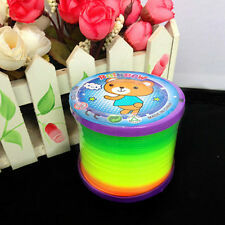 Cute Colorful Rainbow Plastic Magic Spring Glow-in-the-dark Slinky Children Toy. 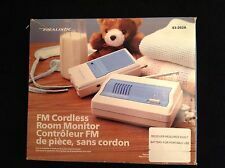 Product list: 1X Children Educational Toy. Material: Plastic. We want to make sure you are happy with our item. Goods without RMA number will NOT be accepted. 1 x Rainbow Circle. Fit For:3-14years old. Children essential childhood playmate, simple and convenient. Product View. 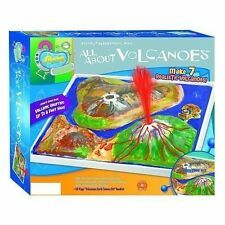 Product list: 1X Children Educational Toy. Material: Plastic. We want to make sure you are happy with our item. Goods without RMA number will NOT be accepted. We'd like to settle any problem in a friendly manner. Made of Lightweight rainbow Coloured Plastic. Vividly Coloured Flexi Springs. Bring Lots of fun for whole Family. Cute Colorful Rainbow Plastic Magic Spring Glow-in-the-dark Slinky Children Toy. We'd like to settle any problem in a friendly manner. Material: Plastic. We want to make sure you are happy with our item. Disney Pixar Toy Story Slinky Dog Jr. is the scrappy little pup of the Slinky Dog family. from head to toe and 6in. from nose to end with a 3in. spring tail. long, so if the going gets tough, this pup gets growing!